Click the button below to add the Viper Soft Deck to your wish list. If you’re looking to get into the sport of windsurfing, the Viper is your ticket to ride! Our years of experience and thorough knowledge of the sport has allowed us to build the ultimate weapon for new sailors to get started. The Viper epitomises all components needed to take the progressive rider from zero to hero. Giving confidence to newbies for those first steps onto the board, all the way through to speeding away in the harness and using the footstraps, progression will seem effortless. The retractable daggerboard and robust Power Box fin offer up impressive versatility. For lightwind manoeuvres full of flow, through to the more advanced fun board the Viper is the one stop shop for all your needs. Beginners and novices alike will relish in the Softdeck padding, while the long and adjustable mast track enhances the tuning characteristics of the board. With new fresh graphics, the High Resistance Skin (HRS) offers tough durability and gives great longevity across all of the available sizes and the five different widths, up to its largest addition, Viper 91. 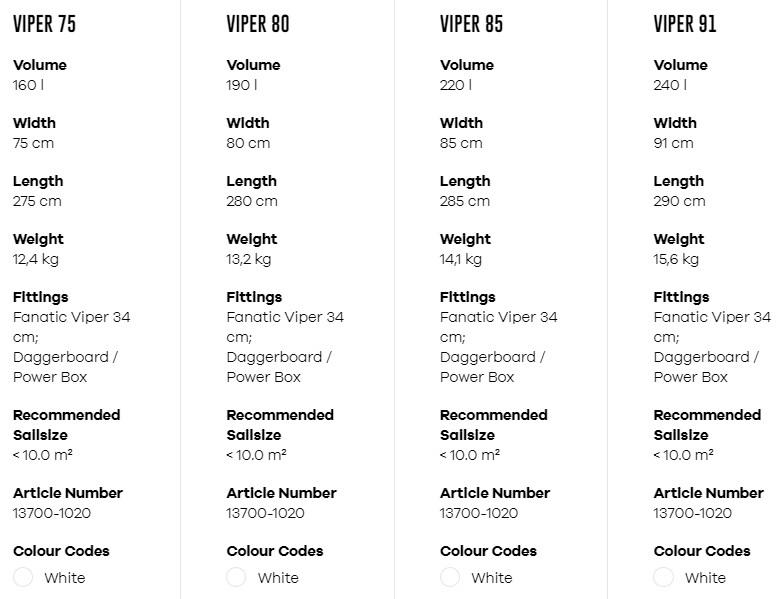 There’s no doubt that the Viper range is exceptionally accommodating to every size, age and skill of rider.